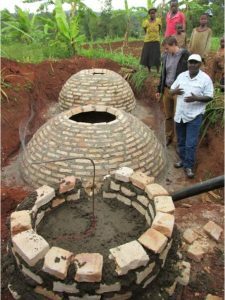 The Rotary Club of Gravesend is proud to provide financial support to the Rotary Club of Sidcup in their application for a grant to provide BIODIGESTERS to the farmers of south Rwanda. The Southern Province of Rwanda contains some of the poorest Districts, three of which are Huye, Nyantza and Nyamagabe, with which this project is concerned. 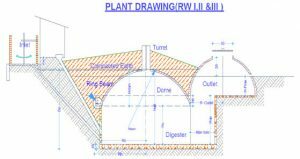 As you can see from the picture a ‘biodigester’ is simply a bricks and mortar construction in a hole about 4 cubic metres, sealed with a dome. Into this construction water, animal dung and other vegetable wastes- even human wastes – are deposited. The benefits to the poor farmers and their families are huge. Visit the Sidup Club’s Biodigesters site (opens in a new tab/page).